As we first last week based on numerous reports it's become official: Rick Tocchet will be leaving the Penguins bench for that of the Arizona Coyotes. Tocchet has agreed to a four year deal with the Coyotes to become their next head coach following the departure of long time coach Dave Tippet. The Coyotes have made a number of large moves this summer, parting ways with the old guard to bring in the new. Acquiring players like Antti Raanta, Derek Stepan and Niklas Hjalmarsson while jettisoning long time figures Shane Doan and Mike Smith. Tocchet will be leaving the Penguins, where his duties focused on offense, to return to the Arizona/Phoenix/Winnipeg franchise where played for three seasons and served as assistant coach under Wayne Gretzky, even acting as interim head coach while Gretzky was away for a family loss. While with the Coyotes, in 2006, Tocchet was charged and pleaded guilty to being the head man in a nationwide gambling circuit out of New Jersey that also involved Janet Gretzky, Wayne's wife. He served two years probation for his role in the gambling ring. When he returned to hockey he was named the coach of the Tampa Bay Lightning following the termination of Barry Melrose. In a season and a half as coach the Lightning went 53-69-26, missing the playoffs in both the 2008-09 and 2009-10 season before his termination. He returned to coaching with the Penguins in 2014 when he was named a part of the incoming coaching staff's assistants, no matter who was hired. It caused some internal strife as several candidates balked at being told who they had to hire instead of bringing on their own people. As we first reported it was the reason Bill Peters and Willie Dejardins turned down the Penguins before they settled on Mike Johnston. 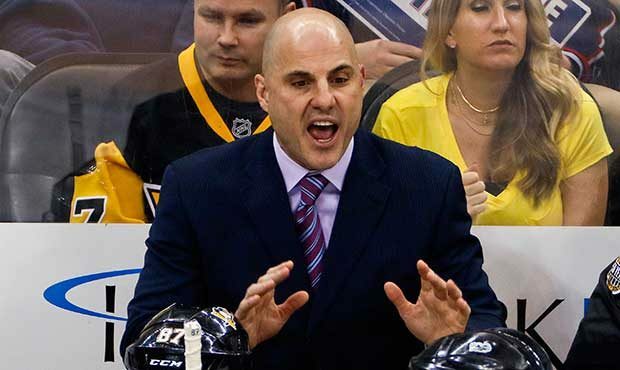 Tocchet would survive Johnston to become key to the Penguins back-to-back championships. Working with the offense, and by many accounts being the one that calmed things between Phil Kessel and Mike Sullivan, he leaves a hole the Penguins will look to fill as soon as possible. Names such as Mark Recchi and Joe Mullen have already been tied to the vacancy. UPDATE: The Penguins waste no time filling that void, naming Mark Recchi as the new assistant coach.